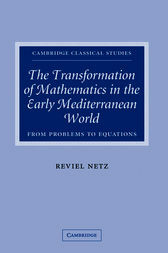 The transformation of mathematics from ancient Greece to the medieval Arab-speaking world is here approached by focusing on a single problem proposed by Archimedes and the many solutions offered. In this trajectory Reviel Netz follows the change in the task from solving a geometrical problem to its expression as an equation, still formulated geometrically, and then on to an algebraic problem, now handled by procedures that are more like rules of manipulation. From a practice of mathematics based on the localized solution (and grounded in the polemical practices of early Greek science) we see a transition to a practice of mathematics based on the systematic approach (and grounded in the deuteronomic practices of Late Antiquity and the Middle Ages). With three chapters ranging chronologically from Hellenistic mathematics, through late Antiquity, to the medieval world, Reviel Netz offers an alternate interpretation of the historical journey of pre-modern mathematics.